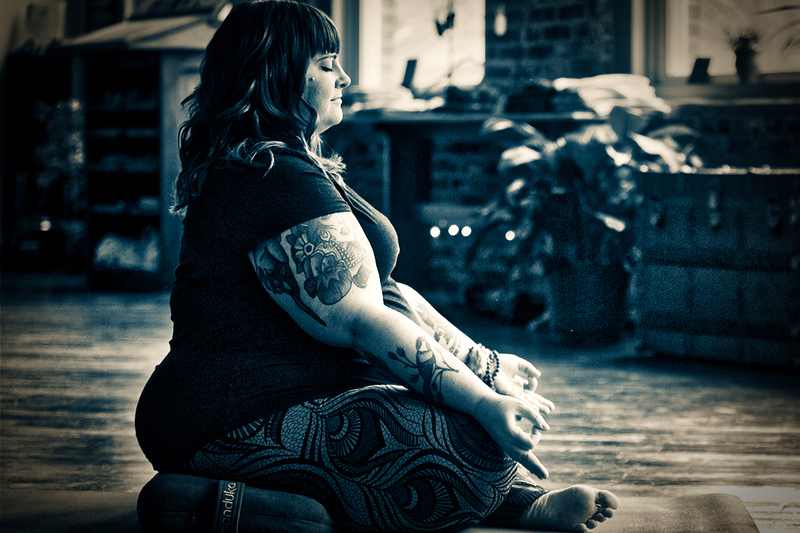 Amber Karnes is the founder of Body Positive Yoga and creator of the Body Positive Clubhouse, an online community that uses yoga to help members build unshakable confidence and learn to live out loud. Amber seeks to further the message of inclusivity, consent, agency, body sovereignty, and accessibility for all (on and off the yoga mat). She has been teaching yoga since 2010 and is a Yoga International featured teacher. What were your first experiences with yoga like? I remember the first time I stepped into a yoga class. I sat in my car until I was almost late for class. My heart was racing as I unrolled a mat at the back corner of the class. I didn’t know the first thing about yoga. But I was pretty sure that people like me didn’t belong in a yoga studio. You see, I am plus-sized. A person in a bigger body. A fat lady (you can pick the word that you like, I identify as “fat”). This big body has always been my “yoga body.” Yoga marketing and the covers of magazines had taught me that only thin, wealthy, hyperflexible, white women practiced yoga, and so there I was in my fat, awkward, tattooed body and my decidedly non-fashionable workout clothing, nervous and waiting for class to start. I struggled through that first class, but felt such a profound benefit from the internal regulation tools that yoga offered me, that I kept coming back. After each class, my mind was quieter, I was less self-conscious, I felt more grounded in my body. But that doesn’t mean the physical practice of yoga felt easy to me. When I began practicing yoga, teachers didn’t know what the heck to do with me. Even though my body wasn’t making many of the shapes that they were asking of it, in most of the classes I went to, I was ignored. Teachers didn’t offer me modifications, variations on poses, or ways to personalize my practice. Sometimes teachers would tell me to “use a prop if I needed one,” but I was clueless on what to do with props. Looking back now, being ignored for a few years of my practice was a gift, because it meant that I had to be creative and have agency when it came to my practice. Back then, there weren’t online videos telling you how to modify poses. There weren’t yogis who looked like me with hundreds of thousands of followers on Instagram. And in class, no one was telling me why I couldn’t step my foot forward between my hands to get from down dog into a lunge or how to get there in a different way, so I had to figure it out myself. Why did you decide to become a yoga teacher? A few years into my practice, I decided to take teacher training. I didn’t think I’d ever teach, but I wanted to deepen my practice and learn “the rest of the yoga.” Halfway through teacher training, experiencing this training in a bigger body, I had an a-ha moment. I realized that most folks who attend class who don’t fit the dominant body identity in yoga (folks in bigger bodies, older folks, people with disabilities, and so on) would attend class, most likely with a teacher who didn’t know how to work with them, and leave class thinking their body was wrong for yoga, that yoga spaces aren’t for them. When in reality, most teachers just don’t know how to work with folks in bodies like mine (or like these other folks I’m describing). Contrary to what media images would have us believe, yoga is not just for thin, wealthy, flexible, white women. Wellness belongs to all of us. Wellness is our birthright. All those years I had been practicing, I longed to enter a yoga classroom and see a teacher who looked like me at the front of the class. I decided to be that teacher for someone else. What practices help you shine your light brightly into the world? What has been your biggest obstacle to seeing your inner radiance? While I love the asana practice because of the way it makes my body feel, the internal regulation tools I found with yoga — pranayama, meditation, and mindfulness practices — have been the most powerful for me. The asana practice was a tool to make friends with my body and learn to listen to my body, but the subtler practices of yoga helped me make friends with my mind. I’ve struggled with anxiety and depression since my teenage years, and yoga was one of the first tools I found that consistently helped me to feel more at home in my body, and more grounded, less stressed, and less anxious in my mind. That has been a huge gift. I think a lot of us struggle with self-doubt. When I am feeling afraid, less-than, discouraged, or not good enough, the yoga practice helps me stay in touch with who I really am. When I feel this way, I can take a few minutes to get quiet, reconnect with my breath, witness what’s happening with my mind, and feel the sensations in my body. I can come back to center and remember who I am, why I am doing this work, and keep an eye on the thoughts that have me feeling stuck and decide whether they are helpful or harmful, and how I’d like to change them. What is your passion in teaching? My passion in teaching is to make wellness and the yoga practices accessible to those of us who are marginalized. I love empowering students to personalize their practice to fit their unique bodies and experiences. Each of us can practice yoga, no matter our shape, size, age, or ability. Our practice just might look different from others. Learning to personalize my yoga practice helped me make peace with my body. As I learned to use my body in new ways with asana, I became more physically fluent, and that changed everything. Mindful movement made me more certain of myself. My body got stronger. I learned to move with intention. And the subtler practices of yoga helped me make friends with my mind as well. My yoga practice helped me feel sure—helped me know in my bones—that my body was a powerful, good, and safe place to be. I want to help my students understand that their bodies aren’t wrong for yoga, that their bodies aren’t problems to be solved. I want to share the life-changing benefits of this two-pronged approach to embodiment that has been so powerful for me: movement and mindfulness. Most of all, I want to share with others the amazing gift that yoga has given me: turning my body into a place that I can call home. Do you ever struggle in your own practice? How do you get through it? When I get discouraged in my practice or question whether I should be doing this work, I just reconnect with my “why”. I listen to my students and learn something new from them. I marvel at the changes that the practices have brought into my own life and the lives of my students. I remember that no feeling is final, and try to remind myself that I have the tools to sit in this type of discomfort. When I struggle or catch myself in a spiral of negative thoughts or self-doubt, I try to remember that discomfort is usually my biggest opportunity for growth. I take the opportunity to get quiet and centered, to witness my thoughts, and then make time for some compassionate self-study so that I can understand what’s happening in my mind, and what I might need to change. What are your future plans and dreams? Right now I have the opportunity to be of service by traveling and working with teachers and studio owners who want to make their classes more equitable and inclusive for all. I am looking forward to continuing to travel next year leading trainings for Accessible Yoga, workshops on making peace with your body, as well as my annual retreats. I’ll continue certifying Yoga For All teachers through the program I co-created with Dianne Bondy. And I am thrilled to be leading my first 200-hour Body Positive Yoga teacher certification starting next fall in Richmond, Virginia. My dream for the future of yoga is that any student who wishes to access the practice can enter a classroom and be able to have a successful, affirming experience. Each studio or yoga space would understand how to break down barriers to wellness for marginalized folks. The physical space would be accessible and welcoming, the teachers would have experience and information about how to teach to folks of all shapes, sizes, ages, and abilities in a trauma-informed and compassionate way. And the students would feel part of a community, where the practices that have been so powerful for many of us could be enjoyed by all. I will keep working to that end, and hope to be of service to all who wish to access yoga. These practices have changed my life and made me a stronger, more resilient, more compassionate person. I hope to continue to spread that gift. Is Your Yoga Practice Getting Stale? 4 Ways to Change It Up! There is one way of breathing that is shameful and constricted. Then there's another way; a breath of love that takes you all the way to infinity.